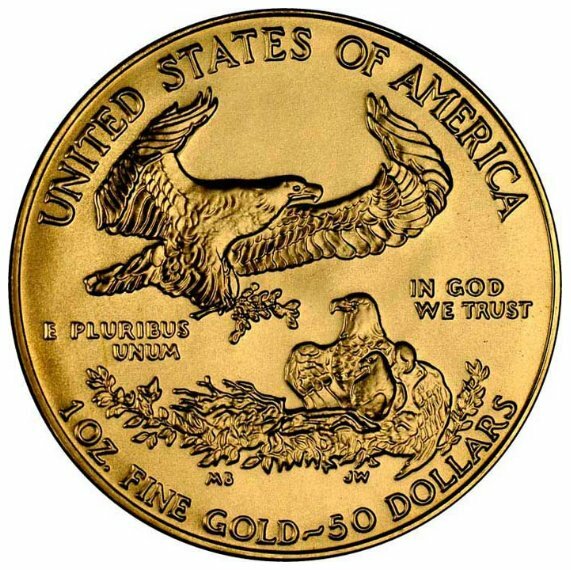 American Eagle gold coins were first issued in 1986 by the U.S. Mint. They are available in 1, 1/2, 1/4 and 1/10 troy ounces. 91.67% gold (22 karat), 3% silver, and 5.33% copper. Minted to exacting standards, the obverse (front) design is inspired by what's often considered one of America's most beautiful coins: Augustus Saint-Gaudens' celebrated $20 gold piece, minted from 1907-1933. The reverse design, by sculptor Miley Busiek, features a male eagle carrying an olive branch flying above a nest containing a female eagle and her hatchlings. Gold is an internationally recognized monetary and financial asset held in reserve by major governments. The reverse, designed by Miley Busiek, features a male eagle carrying an olive branch flying above a nest containing a female eagle and her hatchlings. The U.S. Mint produces proof versions for collectors. In July 2009 the U.S Gov. sold 86,000 one ounce coins as compared to 47,000 in July 2008. During the first few years of American Eagle gold bullion coin production, the U.S. Mint did not use standard dates on the coins. Instead, the date was given in Roman numerals. Beginning in 1992, the dates on U.S. gold eagle coins are modern standard digit years. 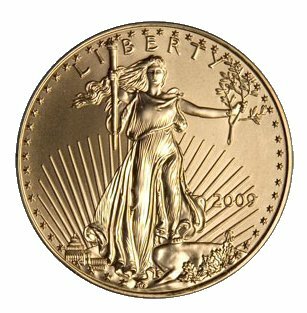 Gold Eagle bullion coins can be bought and sold at local coin dealers or online. A premium is usually added in addition to the spot price of gold for each coin when you buy. These premiums vary dealer to dealer but generally follow the trend. Generally you will pay more for fractional coins than the 1 oz. coin on a basis of gold content. For example, if the 1 oz. gold eagle coin is selling for $1,742 you would expect the 1/2 oz. gold eagle coin to sell for half or $871, but instead, the half oz. gold coin usually would sell for about $914 or $43 more. The same holds true for the 1/4 oz. and the 1/10 oz. gold coins. If buying online, an additional charge for shipping and insurance may apply. The current spot price is available online from www.kitco.com when the markets are open. Always buy from a known reputable source. Coin dealers who are members of the American Numismatic Association subscribe to a code of ethics which generally makes them more trustworthy.